In November 1862, Battle of Antietam in Maryland, but had not been able to destroy Lee's army, nor did he pursue Lee back into Virginia aggressively enough for Lincoln. The Right Grand Division, commanded by Maj. Gen. Alfred Pleasonton was attached. The Center Grand Division, commanded by Maj. Gen. Andrew A. Humphreys). A cavalry brigade under Brig. Gen. William W. Averell was attached. The Left Grand Division, commanded by Maj. Gen. George D. Bayard was attached. The John Bell Hood, and Brig. Gen. Robert Ransom, Jr. The Union Army began marching on November 15, and the first elements arrived in Falmouth on November 17. Burnside's plan quickly went awry—he had ordered Cyrus B. Comstock and the Engineer Brigade commander Daniel P. Woodbury indicate that Burnside had assumed the bridging was en route to Washington based on orders given on November 6. December 13 began cold and overcast. A dense fog blanketed the ground and made it impossible for the armies to see each other. Franklin ordered his I Corps commander, Maj. Gen. Reuben Lindsay Walker, and Meade's attack was stalled about 600 yards from his initial objective for almost two hours by these combined artillery attacks. Early's division began a counterattack, led initially by Col. Edmund N. Atkinson's Georgia brigade, which inspired the men from the brigades of Col. Hiram G. Berry and John C. Robinson, which broke the Rebel advance that had threatened to drive the Union into the river. Any further Confederate advance was deterred by the arrival of the III Corps division of Brig. Gen. Daniel E. Sickles on the right. General Burnside, who by this time was focused on his attacks on Marye's Heights, was dismayed that his left flank attack had not achieved the success he assumed earlier in the day. He ordered Franklin to "advance his right and front," but despite repeated entreaties, Franklin refused, claiming that all of his forces had been engaged. This was not true, however, as the entire VI Corps and Brig. Gen. Abner Doubleday's division of the I Corps had been mostly idle, suffering only a few casualties from artillery fire while they waited in reserve. 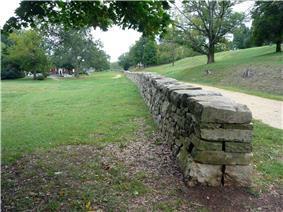 The sunken road at Marye's Heights in 2010. Approximately 3,000 Confederate infantrymen were lined up in multiple ranks behind the stone wall for about 600 yards, and another 3,000 were atop the slope behind it, along with their artillery. Sumner's original order called for the division of Brig. Gen. John C. Caldwell. Leading his two regiments on the left, Col. Nelson A. Miles suggested to Caldwell that the practice of marching in formation, firing, and stopping to reload, made the Union soldiers easy targets, and that a concerted bayonet charge might be effective in carrying the works. Caldwell denied permission. Miles was struck by a bullet in the throat as he led his men to within 40 yards of the wall, where they were pinned down as their predecessors had been. Caldwell himself was soon struck by two bullets and put out of action. While the Union Army paused, Longstreet reinforced his line so that there were four ranks of infantrymen behind the stone wall. Brig. Gen. Joseph B. Kershaw. General Lee expressed concerns to Longstreet about the massing troops breaking his line, but Longstreet assured his commander, "General, if you put every man on the other side of the Potomac on that field to approach me over the same line, and give me plenty of ammunition, I will kill them all before they reach my line." Brig. Gen. John Bell Hood's brigades had marched north to reinforce Marye's Heights. Griffin smashed his three brigades against the Confederate position, one by one. Also concerned about Sturgis, Couch sent the six guns of Capt. John G. Hazard's Battery B, 1st Rhode Island Light Artillery, to within 150 yards of the Confederate line. They were hit hard by Confederate sharpshooter and artillery fire and provided no effective relief to Sturgis. 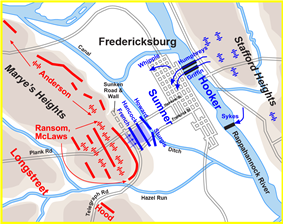 A soldier in Hancock's division reported movement in the Confederate line that led some to believe that the enemy might be retreating. Despite the unlikeliness of this supposition, the V Corps division of Brig. 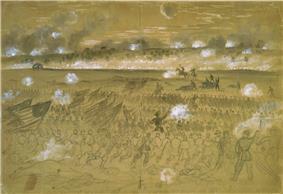 Gen. regular army division to support Humphreys's retreat, but his men were caught in a crossfire and pinned down. 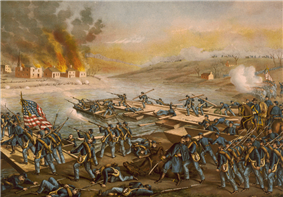 The Union army suffered 12,653 casualties (1,284 killed, 9,600 wounded, 1,769 captured/missing). Two Union generals were mortally wounded: Brig. Gens. Conrad F. Jackson. The Confederate army lost 5,377 (608 killed, 4,116 wounded, 653 captured/missing), most of them in the early fighting on Jackson's front. Confederate Brig. Gens. Maxcy Gregg and T. R. R. Cobb were both mortally wounded. The casualties sustained by each army showed clearly how disastrous the Union army's tactics were. Although the fighting on the southern flank produced roughly equal casualties (about 4,000 Confederate, 5,000 Union), the northern flank was completely lopsided, with about eight Union casualties for each Confederate. 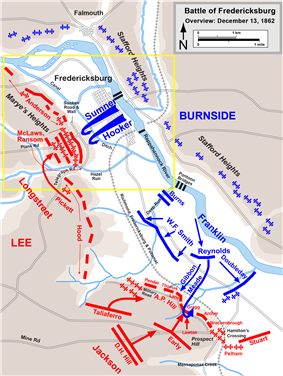 Burnside's men had suffered considerably more in the attack originally meant as a diversion than in his main effort. 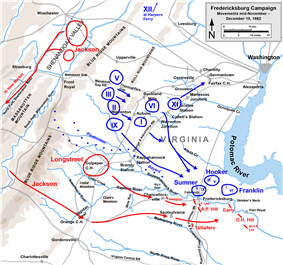 In March 2003, the John Gibbon launched their assault against Lt. Gen. Thomas "Stonewall" Jackson's Confederates holding the southern portion of the Army of Northern Virginia's line at Fredericksburg. 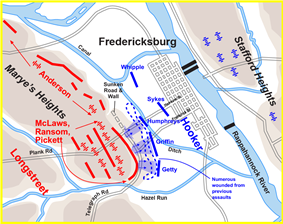 Despite suffering enormous casualties the Federal troops under Meade were able to temporarily penetrate the Confederate line and for a time represented the North's best chance of winning the Battle of Fredericksburg. The fighting on this southern portion of the battlefield, later named the Slaughter Pen, produced 5,000 casualties and five Medal of Honor recipients. ^ a b Eicher, p. 405. Foote, p. 44, claims that this number was later acknowledged to be 4,201, based on over 1,000 men who had been considered wounded or missing returning from Christmas holidays with their families immediately after the battle. Goolrick, p. 779, agrees with this figure. ^ Eicher, pp. 396–97; O'Reilly, p. 21; Welcher, pp. 700–701. ^ Eicher, p. 397; O'Reilly, p. 10. ^ Rable, pp. 192–203; O'Reilly, pp. 135–65; Goolrick, pp. 63–65; Eicher, p. 400; Salmon, p. 163. ^ Emery, Theo (November 11, 2012). "Construction Site Offers Fleeting Glimpse of the Civil War Past". The New York Times (New York). Retrieved November 12, 2012.